Not sure what to do in Chengdu? I got you! 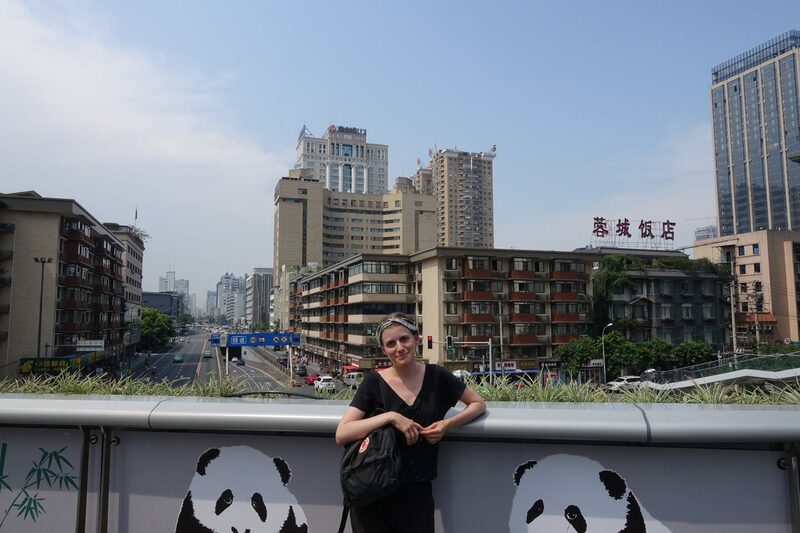 In this post, I am going to share with you my favorite things to do in Chengdu. Chengdu is the capital of China’s Sichuan province and an incredible city. If you are here for a week or longer, make sure to take it all in and explore! People’s Park is a beautiful park in the heart of Chengdu. 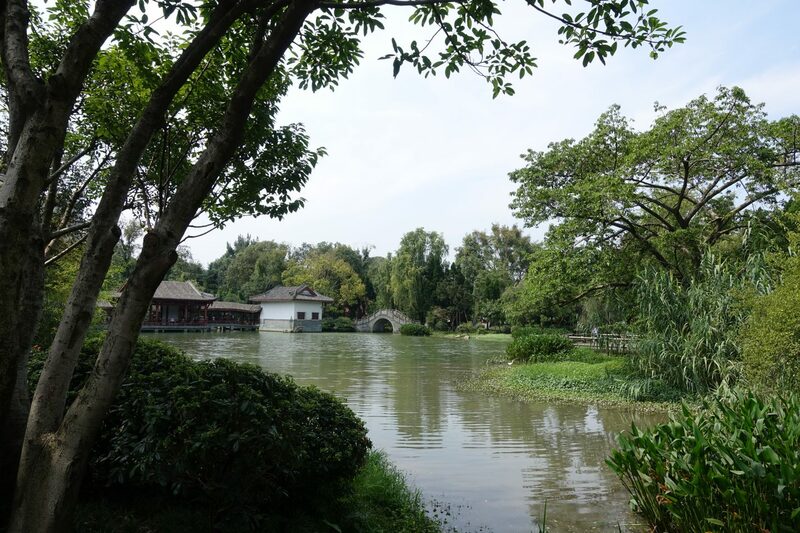 The park features a lake, several tea houses and heaps of pavilions at which you can relax. 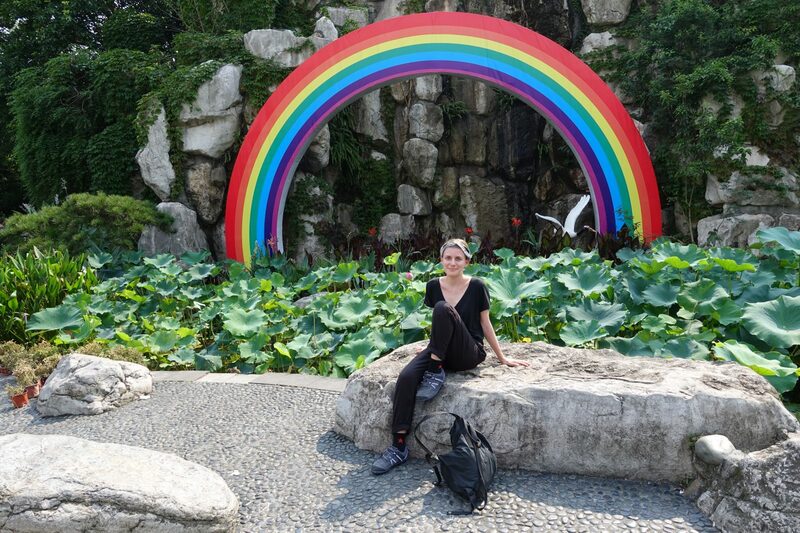 It’s one of the most beautiful parks I’ve ever seen and was definitely one of my favorite things to do in Chengdu. The best part? It’s popular among locals! iBox was built several years ago and is heavily inspired by London’s creative BOX-Park. iBox showcases a handful of cafes, shops, two skate shops and a small skate park. Unfortunately, it appears to be rather neglected these days and yet I still recommend going. Why? Because of its architecture and the shops that are (still) open. Yusuge Garden has the biggest vegan all-you-can-eat buffet I’ve ever seen in my life. If you are lucky you’ll get a coupon handed to you at the door. We then ended up paying 28 RMB each for the all-you-can-eat buffet. 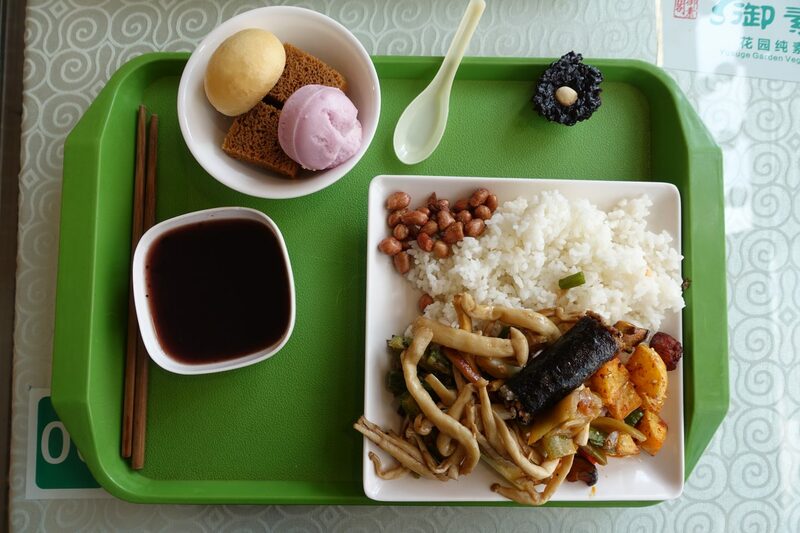 If you want to try local Chinese foods and sweets, then definitely hit up Yusuge Garden! Are you vegan? 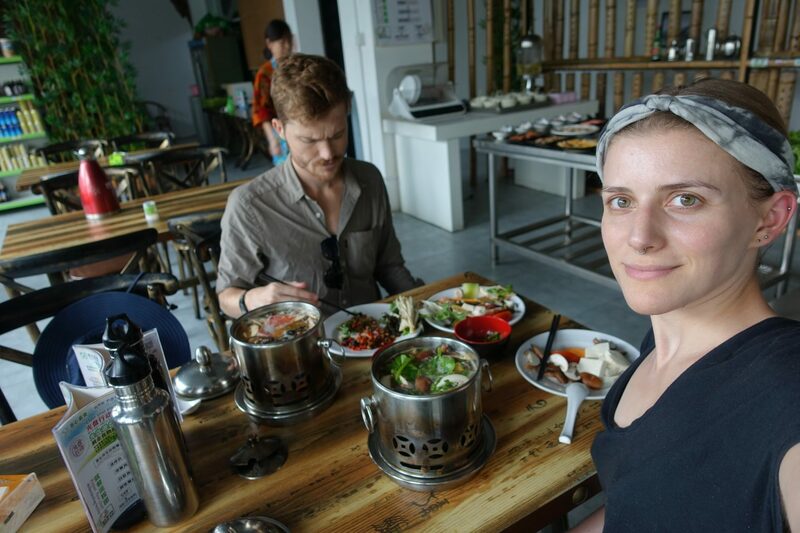 Then make sure to check out my post on my favorite vegan restaurants in Chengdu. The Wuhou Temple in the heart of Chengdu is a huge tourist magnet. There was a huge line in front of the temple and its surrounding areas. I personally don’t need to see every single temple and skipped it. I highly recommend checking out the park surrounding it. It’s beautiful! Also, if you are in the area make sure to hit up Jinli Pedestrian Street. If you walk around Chengdu and you are looking for them you’ll literally see them everywhere. It’s a bowl of jelly, nuts, sugar, and fruit. These types of jellies are a popular dessert! If you want to grab one, make sure to have a note in Chinese on you that states that you are vegan and what you won’t be willing to eat. While most of them are vegan, not all of them are. 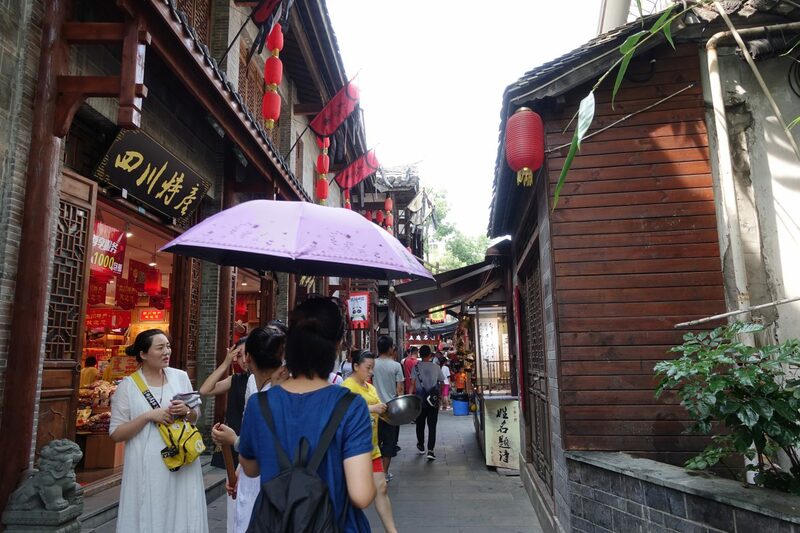 Jinli Pedestrian Street is an incredibly touristy street filled with souvenir stores, local foods, and handicrafts. Unfortunately, most of the food was overpriced and it was a little crowded. I still recommend going, because it makes for a nice stroll and, as mentioned earlier, the park surrounding this street is beautiful! 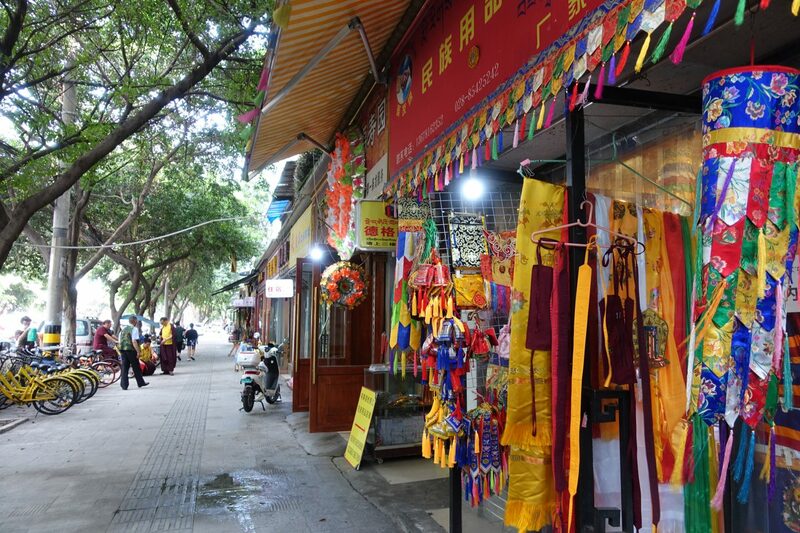 There are around 60,000 Tibetans living in Chengdu and a lot of them are living in the area South of Wuhou Temple. The area is also called “Little Lhasa”. Wuhouci Street is an incredibly vibrant street filled with Tibetan shops and restaurants and I highly recommend checking it out. This was hands down, one of my favorite things to do in Chengdu. My man and I decided to have an all-you-can-eat vegan hot pot at Veganheart Vegan and it was the best thing ever. 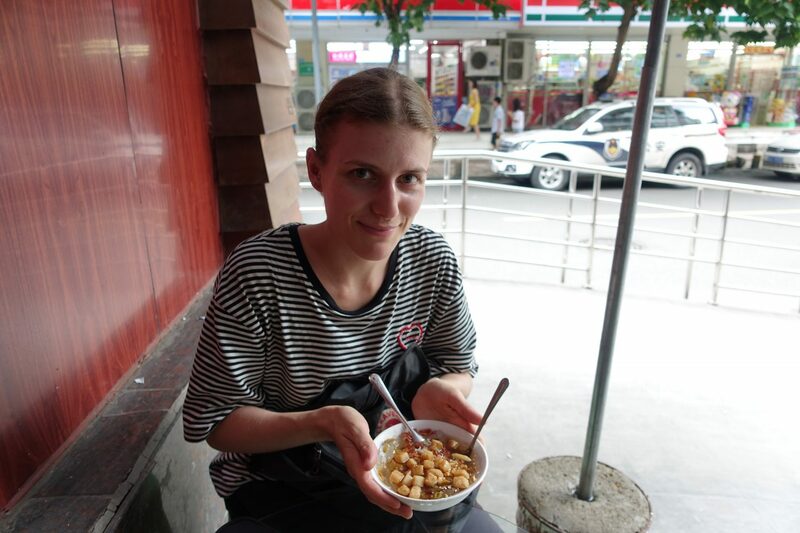 We ended up paying 34 RMB each and had a beautiful experience. I enjoyed it so much that I made a separate post about my experience. Check it out! The Chengdu Museum is incredible! It’s located in the heart of the city (near the square) and admission is free. The museum houses a huge selection of local artifacts! If you want to learn more about Chengdu and the region then this is the place to go. The Chengdu Research Base of Giant Panda Breeding is Chengdu’s #1 attraction. It opened in 1993 to further research and to improve public awareness of the protection of Pandas. The entry fee is 58 RMB if you buy them at the counter and 53 RMB if you buy them on bus d025. If you are wondering about the ethics of it all then I highly recommend reading this. For directions click here. 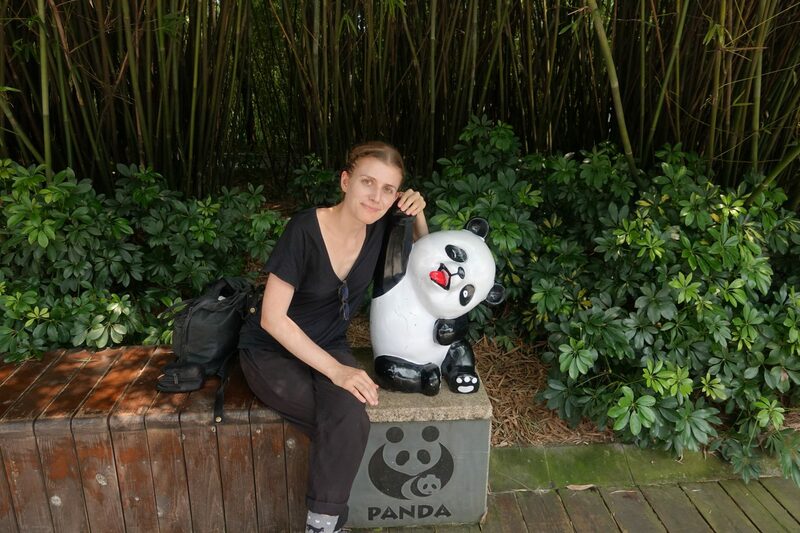 This was definitely one of my favorite things to do in Chengdu! Seriously. I was itching for more piercings and visited The Temple Tattoo Studio. They use implant grade titanium jewelry, their piercer is super lovely and their prices are incredible! Unfortunately, she doesn’t speak English, so if you don’t speak Chinese make sure to get something that doesn’t require having a conversation. 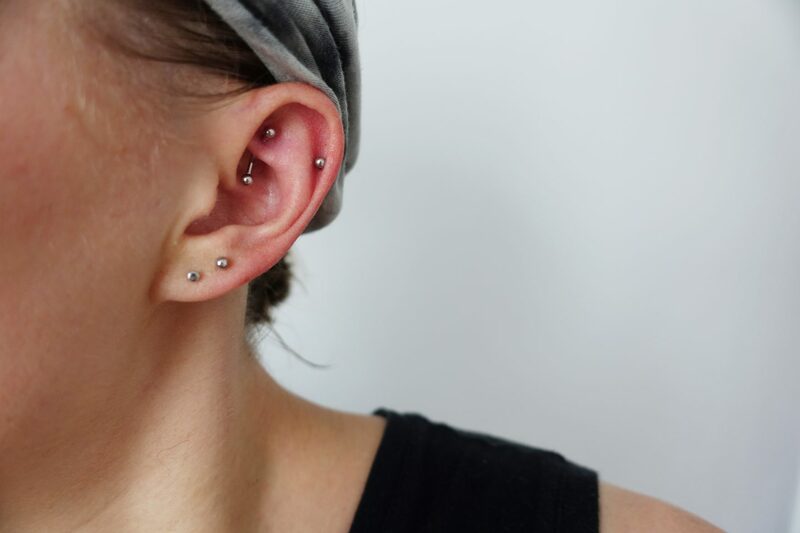 I got a helix piercing, two upper lobe piercings, and a rook piercing and freakin’ love it! I got a haircut in Chengdu for 15 RMB and my man (he has shorter hair) paid 10 RMB. That’s less than $2 for a relatively good haircut. 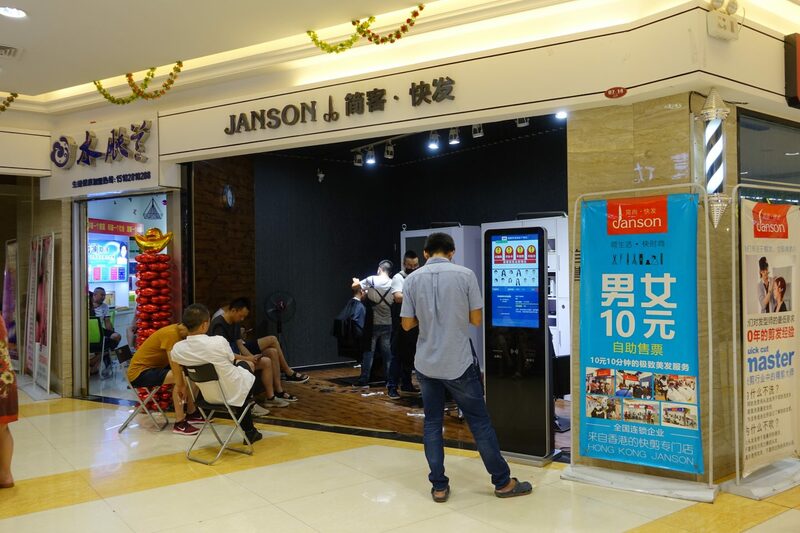 If you are in need of a haircut then keen an eye out for small barber shops that are located within local malls. 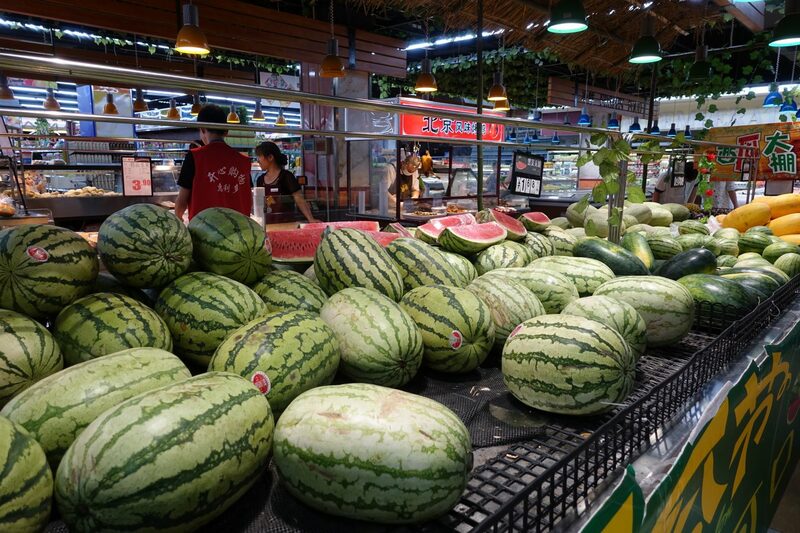 Grocery stores in Chengdu are amazing! While you’ll find international chains such as Wallmart and Carrefour you’ll also find heaps of family-owned stores and smaller local chains. 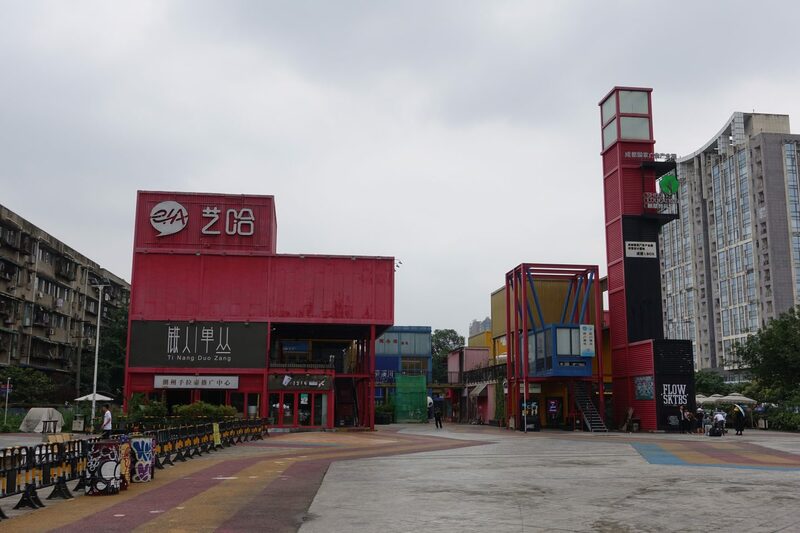 If you are in Chengdu for a longer period of time, definitely visit them. Most of the grocery stores that I went to had an abundance of fruit and vegetables.